Collin requested a big bike ride today--after riding seven miles here before the Disney Cruise, he was inspired to ride at least ten miles today. Granddad and Grandma Gayl were all in on this inspiration. They needed all the exercise they could muster to work off the Disney pounds they gained at sea. We started our ride around 10:30. 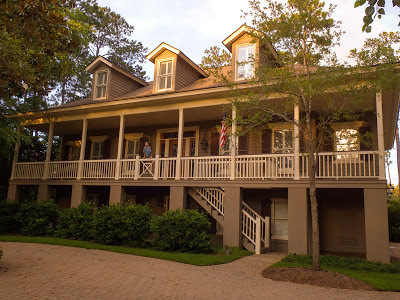 After a couple short water breaks, our first stop was at the Landings Harbor Marina, where we could watch the boat traffic while rocking on the porch of the marina and enjoying some light refreshments. We already had logged seven miles on the odometer, and Collin had tons of energy to spare. We continued our ride on bike paths that passed lots of long lagoons, hoping to come upon a sunning alligator, but the alligators did not oblige us. We did see some egrets, a couple great blue herons, a sunning anhinga, and an osprey flying off with a fish in its talons, though. 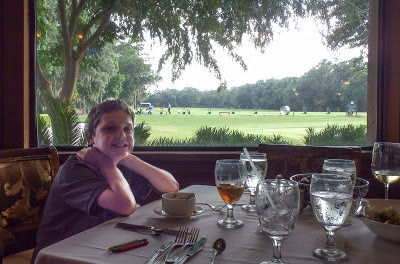 We decided to stop for lunch at the Tennis Center, where we ate out on the verandah overlooking some very good players in the midst of a competitive game. At this point we had completed over ten miles of riding. By the time we made it home, we had ridden 13.2 miles, at an average speed of ten miles per hour! Collin amazed us once again. 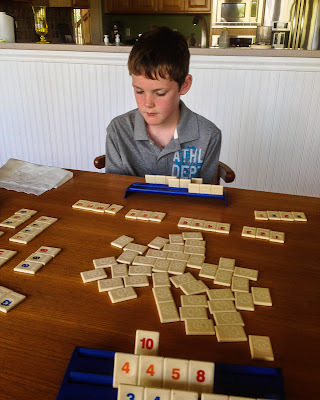 Later in the afternoon, we played some more Rummikub, and Collin won a hard fought game. Then it was time for fine dining at one of our island Clubhouses. We all dressed up in country club casual attire, and headed out. Collin says, “It was a wondrous meal, but Disney was better.” Clearly, after you have experienced the fantasy of life on Disney, it is hard to return to reality. On the way out the door, Granddad introduced Collin to what he called “the best part of dining at the club”-- the big bowl of free chocolate covered mints in the lobby. Both Collin and Granddad reached in and grabbed a handful. Back at home, we worked to get packed up and to bed early--we have a pretty long drive ahead of us to Pigeon Forge tomorrow. 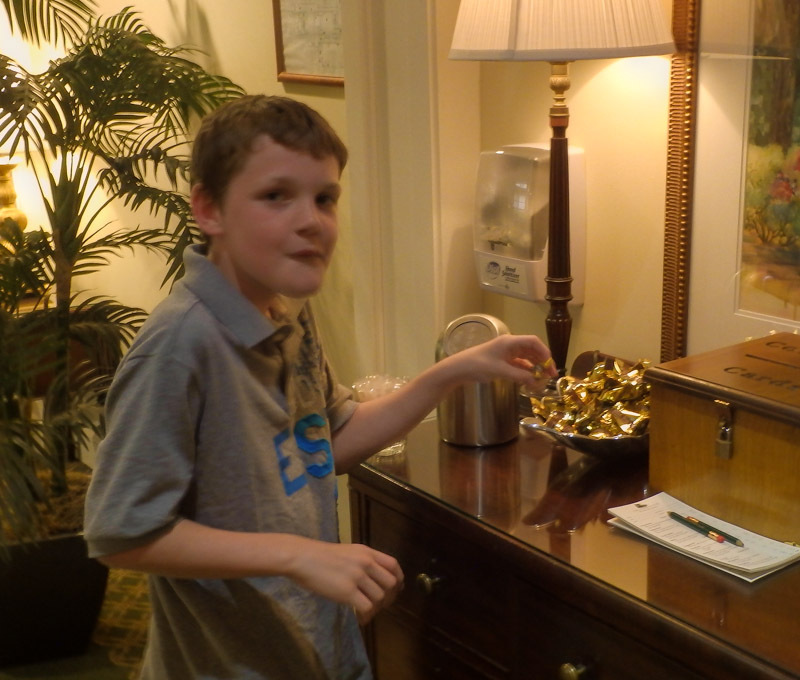 Collin is the first family member to visit our Sea Dog house--we couldn’t ask for a more delightful, fun/funny, and considerate guest. We are REALLY REALLY going to miss him when we pass him back to his Dad and brother tomorrow!